Advancing innovations are driving an immense shift in healthcare. Across the industry, organizations face an inundation of data, often in new and varied formats. This information flood challenges existing infrastructure, yet simultaneously provides a compelling opportunity to unlock new insights. Effective management of data from all sources is critical to track patients throughout the healthcare system while ensuring data is stored and accessed according to appropriate compliance requirements. 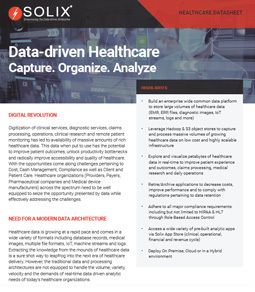 Download this datasheet for a brief overview of how the Solix Common Data Platform is empowering the healthcare industry to better manage growing volumes of data while reducing storage costs and enabling advanced analytics.